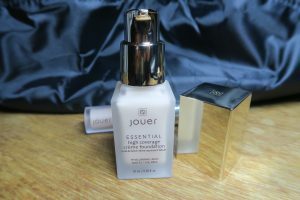 If you read my Jouer Essential High Coverage Liquid Concealer* blog post (if not, check it out here) you’ll know how much I’ve been enjoying the coverage and formula…so I was pretty intrigued to see if I’d like the Essential High Coverage Foundation* as much! They both have similar claims/ benefits/ ingredients and I’d heard great things, so I went in to trying this hopes high! If you’ve been here before you’ll know but for any of you that haven’t (hey!) and for reference…my skin is combination (at this time of year though I’d say more combo/ dry…all the heating, colder weather etc) and fair with golden-neutral undertones (eg. KVD Lock It L43, Too Faced BTW Swan, UD All Nighter 1.0, Fenty 120)…I generally prefer a medium buildable coverage and a natural finish (not too flat chalky matte or so dewy it slides off) but like to have a base product wardrobe to suit any look or mood (I have everything at this stage!) and if I find a formula I love, I’ll just switch up skin prep/ setting sprays and make it work! ✖️ Available in 50 supreme coverage, lightweight and long wearing shades (I use the shade Pearl). ✖️ Concentrated formula (you only need the smallest amount, a little goes a long way). ✖️ Chamomile extract, cucumber extract and Hyaluronic acid to calm, smooth and hydrate. ✖️ Paraben, Gluten and oil free formula. ✖️ 0.68 fl oz./ 20ml – £34/ €38/ $38. The first really obvious thing that both the Jouer concealer and foundation share…the insanely large packaging! It’s nice pretty packaging, don’t get me wrong…outer and inner packaging (I’ll stop saying packaging now in a minute) is a lot bigger than necessary for the actual amount of product! It looks the part, really sleek and feels expensive with it’s frosted bottle and gilded lid/ outer box…but both concealer and foundation have significantly smaller amounts of product than standard sized bottles and I feel the outer boxes are maybe yeah…a tad bit misleading/ unnecessary in my opinion. Saying that, the products arrived in one piece (always good) and the pump on the foundation bottle seems really sturdy/ well made and unlikely to leak/ break. The volume of actual product is displayed clearly though in spite of the bottle to box size difference and Christina (Jouer founder and creative director) explains that a small drop is all you need, so maybe that’ll excuse the 20ml under average size. Jouer also suggest using the specifically designed Essential Precision Foundation Brush* (synthetic, giant tooth brush esq pear shaped buffing brush) to buff it on to the skin…I did try it with my own preferred synthetic buffing brush for arguments sake, but would nearly always use a damp blending sponge* with pretty much all base liquids so have been applying it that way and true to form much prefer it applied with a blender! It’s such a full coverage (it definitely delivers there!) and using a brush would probably work great if you wanted that, but a damp blender works it in to the skin and gives it a way more natural finish without compromising coverage. Also true…you only need a tiny bit and I mean a drop! I’ve not even been using a full pump (I’d say more half a pump) for my full face! With the Essential High Coverage Creme Foundation* being a more matte finish (which it is…a lot more matte than I usually like to go for but I’m actually not mad at it) I definitely need to use hydrating primer with this! 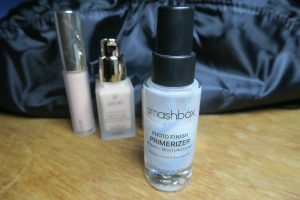 The one I’m using (and really liking) at the moment is the Smashbox Photo Finish Primerizer*. It’s a moisturiser/ primer hybrid (I use this as well as moisturiser at this time of year), super lightweight and plumps/ hydrates as well as keeping makeup look fresher for longer! (It’s CF/ Vegan too!) It stays pretty matte throughout the whole day (more so than most other foundations on my and especially on my nose which can get super oily even when the rest of my face is drier!) but it’s almost as if this foundation looks better the longer you wear it! I prefer how it looks after an hour or so when it’s properly settled. As well as using hydrating primer, unless you have a super oily skin you might want to use a hydrating/ glowy setting spray with this if like me you like the coverage but would rather a natural glow. If your skin’s drier than mine, I feel like you’d need a rich moisturiser on top of hydrating primer/ spray and then even with it being more matte you could still have it work for you if you want a true full coverage and all day wear. Another thing I’d suggest for any skin type wanting to try this, is exfoliation! It will cling to any particularly dry patches if you’re not careful. With proper skin prep and damp blender application though I really like how this looks and feels on! 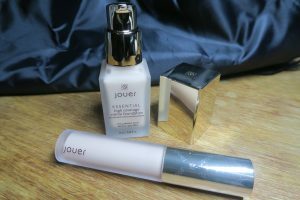 When a brand promises full coverage and lightweight I’m always hoping it is but kind of knowing it won’t be…Jouer though have come through with this one. It doesn’t feel any different to my lighter coverage foundations which is amazing considering the coverage! It does dry pretty quickly so I’d work in sections to avoid any potential cling situations too! The rest of my makeup applies really well over the top and I feel like as well as staying on all day itself…it does make the rest of my makeup last as long and stay looking really good too. Even in areas that I’d normally get wear throughout the day (chin/ around the mouth etc) it’s been lasting way longer and considering it’s full coverage…not wearing off patchy or obvious in any way (which other high coverage formulas can do). I’ve tried mixing the Jouer with a few of my lighter coverage foundations and although it works, it kind of takes over…it doesn’t seem to sheer out as others would. If you like long wear (and fancy trying this) but like me prefer a even but lighter coverage base…just use a tiny amount and boop in on with a blender. You can always add more or build up coverage in certain areas with concealer instead! I do think that the Jouer Essential High Coverage Foundation* is a little on the spendy side considering the 20ml size, but my experience of using it up to now of how little you actually need to use makes me think that it would probably last as long as a typical 30ml regular foundation bottle. It has amazing staying power and as long as you prep properly depending on your skin type (I’m thinking most of us would need extra hydration with this!) it looks beautiful on and does give an airbrush matte look to the skin without feeling heavy. You can absolutely tell you have makeup on of course, but used minimally it looks a lot more natural than expected for this level of coverage! I’ll keep experimenting with it and I can see myself reaching for this when I know I need my makeup to last. I’d probably use this a lot during the summer for that reason too when makeup can slip and slide when the temperatures rise (as much as they do in UK/ Ireland), I doubt this one would! 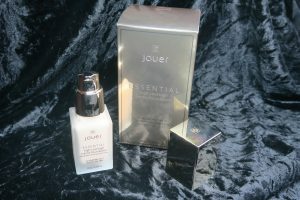 Jouer Cosmetics Essential High Coverage Creme Foundation* is available now! Let me know if you’ve tried it, what did you think? ?